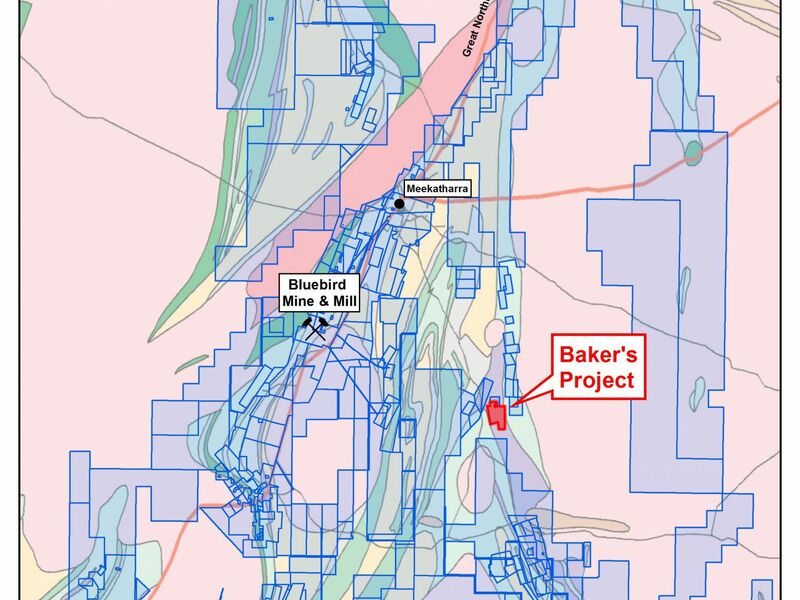 The Bakers Gold project is available for Sale or Joint Venture. It comprises 2 prospecting licences located 25km south east of Meekatharra lying on the eastern limb of the Meekatharra Greenstone Belt. This belt has yielded over 5.5 million ounces of gold and contains a number of producing gold mines including the Andy Well high-grade gold deposit. Generally, the eastern limb of the Meekatharra Belt has not seen the same density of exploration as other parts of the belt. The licence has seen various rounds of historical exploration including separate programmes of wide spaced percussion drilling. 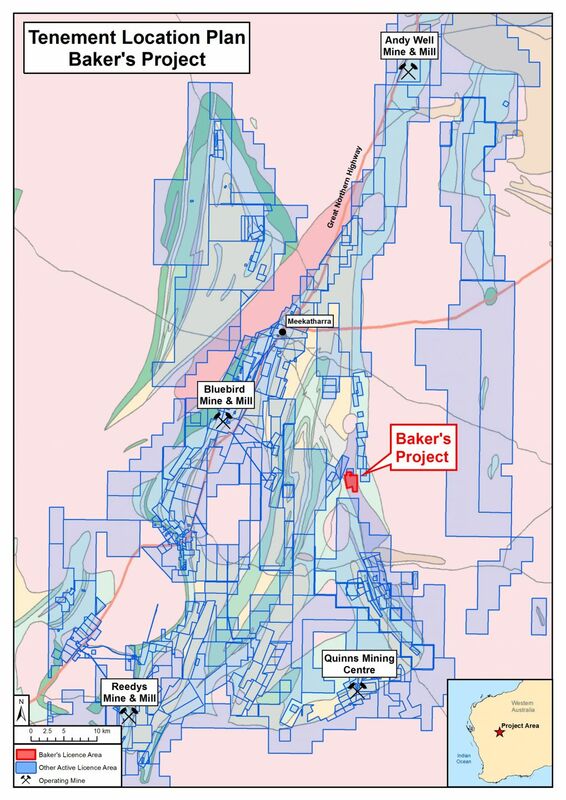 Sunrise has carried out mapping and sampling and three rounds of soil sampling generating a number of gold-in-soil anomalies which, together with historical exploration results, has generated two drill ready prospects. 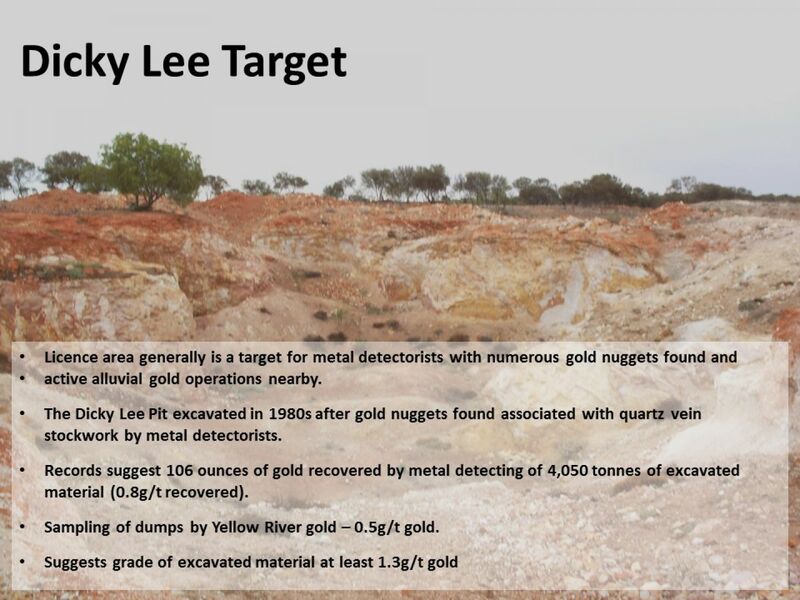 The Dicky Lee Target is an area of small scale open pit mining with pit dimensions of approximately 60m by 40m and depths up to 10m. The pit was excavated in the 1980s following the discovery of specimen quality gold-quartz nuggets, by metal detectorists both at surface and in-situ. The excavated material was not processed for gold extraction by any conventional method but was reportedly scanned for further gold nuggets using hand held metal detectors. It is reported that 106 ounces of gold was recovered by this crude method from 4,050 tonnes of material excavated but the tonnage of material excavated is well in excess of this amount and thus the total amount of gold recovered is unknown. Based on sampling of excavated dump material the estimated grade of mined material is at least 1.3 grammes/tonne gold. The gold at Dicky Lee occurs in a quartz vein stockwork in dolerite. This style of mineralisation presents an attractive target for gold exploration. An example is the Boorara deposit now being defined by MacPhersons Resources. In such deposits multiple narrow fracture filling quartz-veins are found with different orientations and gold may be preferentially associated with certain vein geometries reflecting the rock stress conditions at the time of gold mineralisation. Consequently, drilling results can be heavily influenced by the direction of drilling relative to the orientation of the preferentially gold-mineralised veins. Mapping and sampling was therefore undertaken to establish the geometry of the veins in the stockwork and to establish gold contents. Thirty chip and grab samples were taken from the pit. All contained detectable gold up to 32.1 g/t Au and averaging 1.7 g/t Au. Individual veins are generally narrow (sub-metre and sub-decimetre widths) and so grades being reported cannot be considered representative of the deposit as whole and no attempt was made to systematically evaluate the grade of the hydrothermally altered host dolerite although the few samples taken assayed up to 1.4 g/t Au. Only two historical drill holes have tested the pit area, and both intersected very wide intervals of low grade gold mineralisation (69m grading 0.2g/t gold and 80m grading 0.2 g/t gold including 1m grading 5.7 g/t gold from 5m deep). 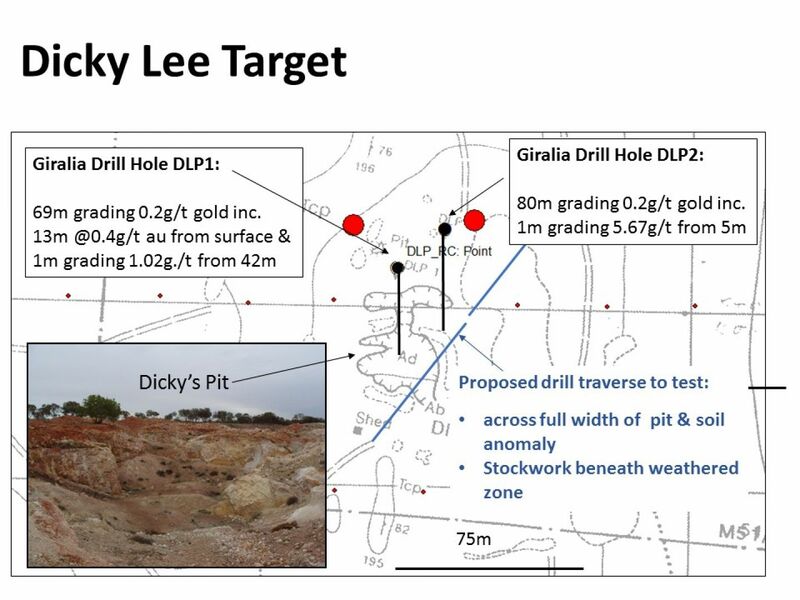 The DRL4 Target lies some 750m south west of the Dicky Lee pit and is named after the number of a historic drill hole DLR4 completed by Australian Consolidated Minerals in 1987. This hole averaged 0.55 g/t Au over the 22m interval from 2m down hole depth to the end of hole at 24m and the final 2m sample assayed 1.17 g/t Au. No follow up drilling was carried out. 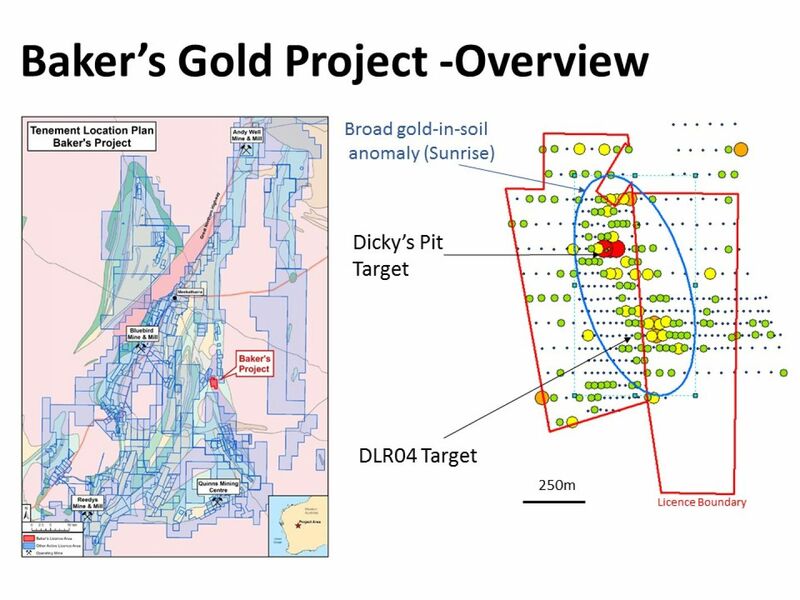 Subsequently drill hole DRL4 was shown to lie within a 500m long gold-in-soil anomaly initially defined by a 100m by 50m soil sampling programme. Infill sampling on a 50m by 25m grid confirmed the original anomaly, increased its tenor and better defined the target for follow up drilling.